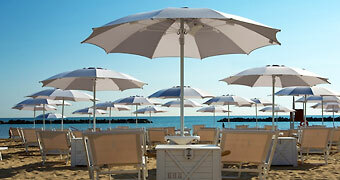 Hanging out in the hilltop towns and Renaissance cities of Italy's Marche. San Leo derives its name from San Leone Dalmata, the saint who evangelized the town. 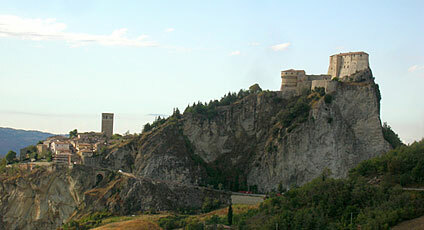 The town is famous because of its fortress, which dominates the Marecchia Valley. San Leo has been awarded the Orange Flag in recognition of its perfectly preserved buildings, of great historical and artistic value, the excellent tourist information services, run by highly qualified staff, and the care taken in keeping the town spotlessly clean. 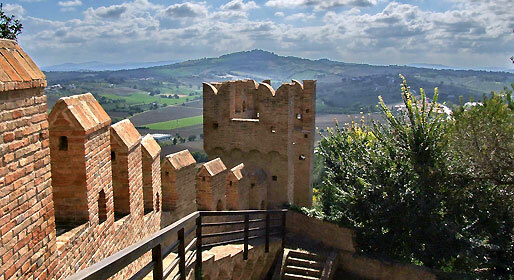 Among the sites to visit there is the Rocca, whose Medieval origins can be seen in the armory, ceramics and antique furniture housed within its walls; the Pieve or pre-Romanesque Basilica, Piazza Dante, the Fort of San Leo, the majestic Cathedral of San Leo built on the site of an ancient Roman temple; the Bell tower with its bell dating back to the 1300s, Palazzo della Rovere, Palazzo Cardini, Palazzo Mediceo, the Forte Museum and Art Gallery.